There’s no denying that Adobe Premiere Pro can do everything the professional video editor needs. And its easy integration with After Effects and Photoshop are definite boons. However, when you import DAV files into Premiere Pro, you may come across lots of problems, such as nothing shows up on the screen, or there is only image or you only get sound in Premiere Pro. Well, according to Adobe, Premiere Pro only accepts AVI, M4V, MOV, MP4, MPEG, MPE, MPG, WMV, files. And you can easily find DAV is not there. Since DAV is not supported by Premiere Pro, in order to edit DAV videos in Premiere Pro CS6/CS5 or CC, you need to convert DAV videos to Premiere compatible format on Mac first before transferring the files to Premiere. 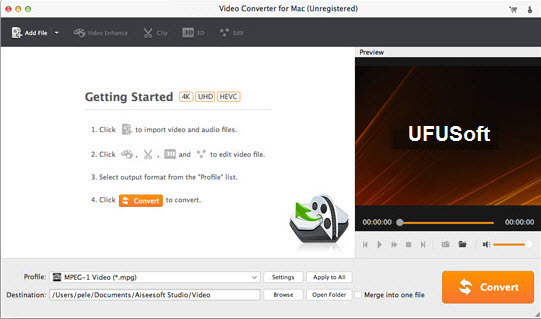 To get the work done, you can just get UFUSoft Video Converter for Mac, which can help you convert DAV to Premiere Pro supported video codecs MPEG/MOV with optimized settings while keeping the video quality. In addition, it can convert all other popular video formats like MP4, MOV, WMV, MXF, FLV, ASF, M2TS, VOB, etc. to Premiere Pro compatible video formats. Now get the tool and add DAV files into Premiere Pro effortlessly. If you want to trancode DAV to MPEG/MOV for Premiere Pro on Windows, please turn to DAV Video Converter. Drag DAV files to the program directly. Or go to the “File” menu, choose “Add Video” to locate the DAV files you want to add. You can add several files to do batch conversion. Click the format bar or the pull down menu of “Format” to select output format-Adobe Premiere/Sony Vegas > MPEG-2 (*.mpg) for Premiere editing easily. Click the “Convert” button to start the DAV to MPEG/MOV conversion. When the conversion is finished, you can click “Open” button to get the generated MEPG files effortlessly. Launch Premiere Pro on your Mac, choose “File > Import to import converted DAV files in Adobe Premiere Pro for further editing. DAV to WAV: How to Convert DAV Files to WAV?